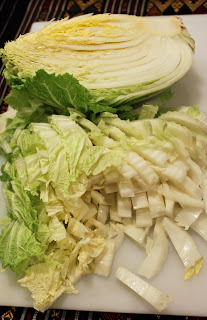 I'm gearing up to make a new batch of Kimchi tonight. The sinks, Mason jars, and utensils are sanitized and set aside and a big fat glass of wine is poured (the wine helps me better channel my mother-in-law Sunee, who taught me her tried and true kimchi method a few summers ago). Kimchi is a staple and a comfort food in our house. We love it with rice and an egg for breakfast, and it can give a nice kick to a quick dinner of any sort of protein with rice and/or noodles. I clean my sink again, because I am a nut about 'sanitizing.' Damn you Food Safety/Food Handlers Certification test! Put the washed, sliced cabbage back in the sink and add a generous 1/3 cup of Kosher salt. Give it a good mix with your clean hands. I just realized you might be wondering..why is this crazy lady using her sink? doesn't she own a bowl? Yes. I have a lot of bowls. However, none of my bowls have a proper drain on them. 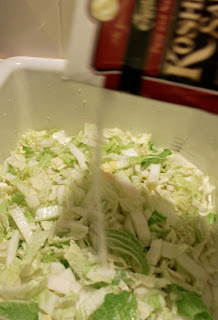 The salt is going to draw a lot of the water out of your cabbage - you want that liquid to fall away from the cabbage and the best place for it is down the drain, since you won't be needing it - ergo the sink! Let it sit and drain for roughly an hour. I plugged my drain to show you how much liquid the salt draws out in just an hour. Wash your leeks really well because they love to hide sand in their layers. I trim the root end, and slice them lengthways in half and then submerge and shake them in a bowl (or clean sink) of cold water a few times, repeating as necessary until all the sand and dirt is out. Then, I slice them just shy of 1/4 inch. 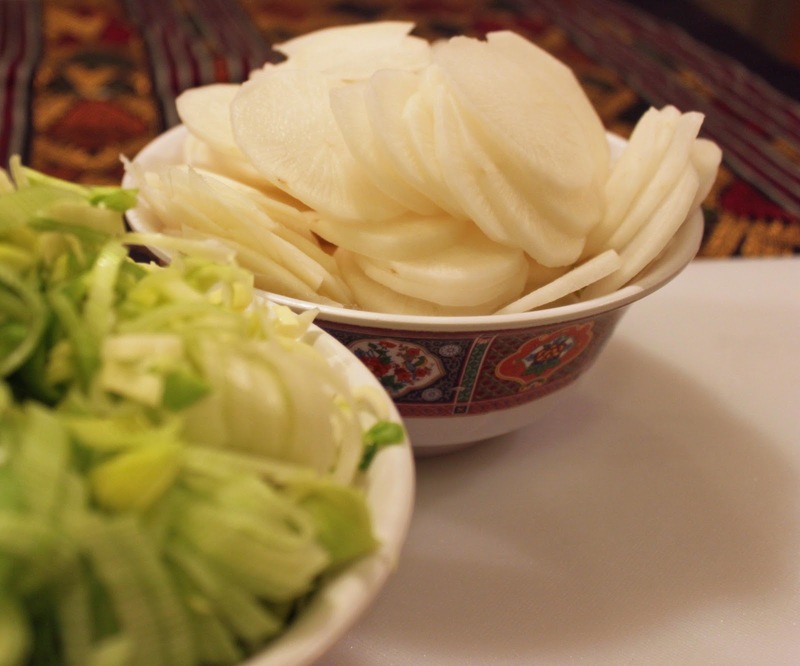 The diakon needs simply to be rinsed, peeled, and sliced thin; you can use a mandolin if you like. Add your thin slices of daikon and leeks. At this point you want to give the cabbage and friends a squeeze. Yep, rough them up real good; breaking the daikon up a bit is OK. Cover your sink with a cutting board or something large enough to fit over top ( I do this because I have cats that are overly curious. If I did not cover it, I'd have bits of cabbage all over the floor tomorrow…Grrrr). Have another glass of wine, go to the bar...whatever. You are finished here and you don't have to look it again until morning. That cabbage isn't going anywhere so have some coffee and relax. 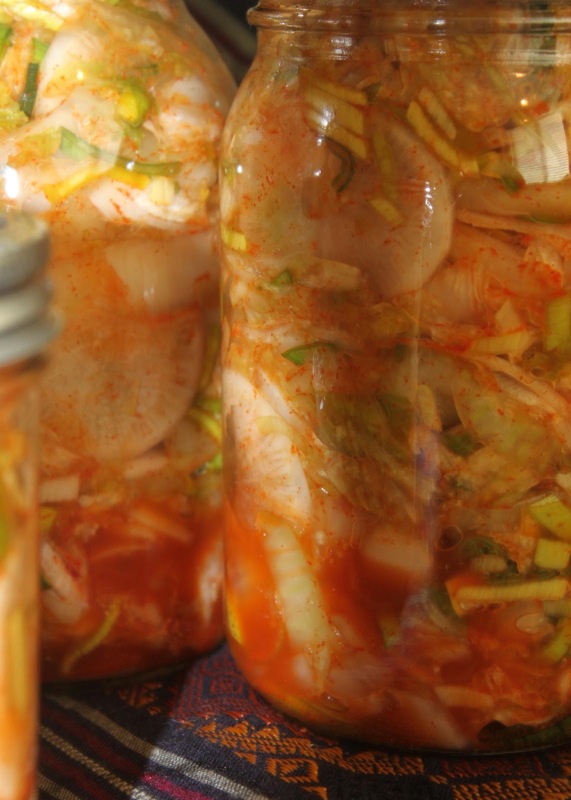 You have a few flavor options to think about when it comes to finishing the kimchi. I have tried using different traditional Asian peppers like freshly smashed Thai chilies, I've also used prepared chilies like Sambal and Sriracha. My mother-in-law has been making Kimchi since she was a kid, much like me and chocolate chip cookies or banana bread. 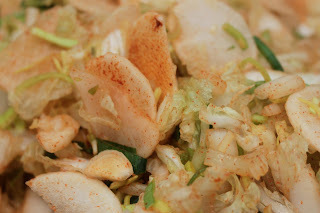 I have seen her tweak only a few things here and there, like adding dried shrimp or anchovies that have been smashed in the mortar and pestle, but her stand-by is fish sauce and ground cayenne. That is exactly what I am using for this batch. If you are vegetarian you can always leave out the fish sauce or use a vegetarian substitute. ... you'll see it has reduced in volume substantially. Now, it's ready for flavoring. I'm going to add a quarter cup of fish sauce and about 3 tablespoons of cayenne (you can add more or less depending how spicy you like it). I really have to insist that you wear food prep gloves or plastic bags on your hands for this part, if you don't please remember NOT to rub your eyes or touch your face (or other sensitive areas) for many hours. Now that your hands are covered, give everything a good mixing to distribute the cayenne and fish sauce. 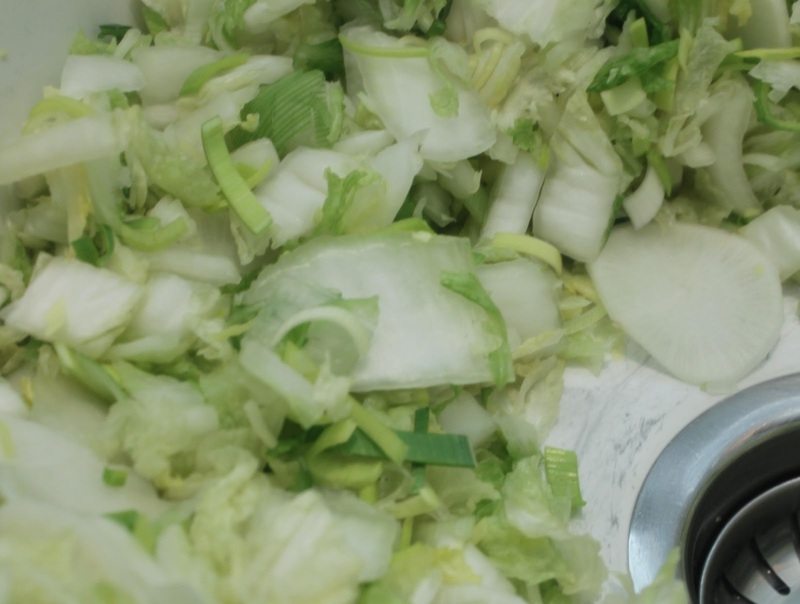 Set your sterilized jars in the sink and pack them full, smashing the cabbage down as you go until no more can possibly fit. Cover each jar with a small plate weighted down by something fairly heavy. Place the jars in a plastic container to catch any liquid that might overflow during fermentation. Set this on your kitchen counter. It should take one to two weeks to ferment at about 70 degrees Fahrenheit. The longer you leave it out, the more sour it will become as more lactic acid is being produced. After a week, taste it. If you like how sour it has become put the lids on and put it in the refrigerator. If you feel like it's not ready, keep it out another few days to a week. My mother-in-law does a 'quick ferment' when she visits us here in the summer. It's easy to do because we look at 90 degree+ temperatures nearly every day: she simply puts the lids and rings on right after she packs the jars, sets them outside in the sun for three days, and magically, it's done! What can I say..? She's genius! Sunee would casually say, "Simple. Easy. No need bury!" I just read through this without my "editing goggles". Well done! I'll be making some soon!